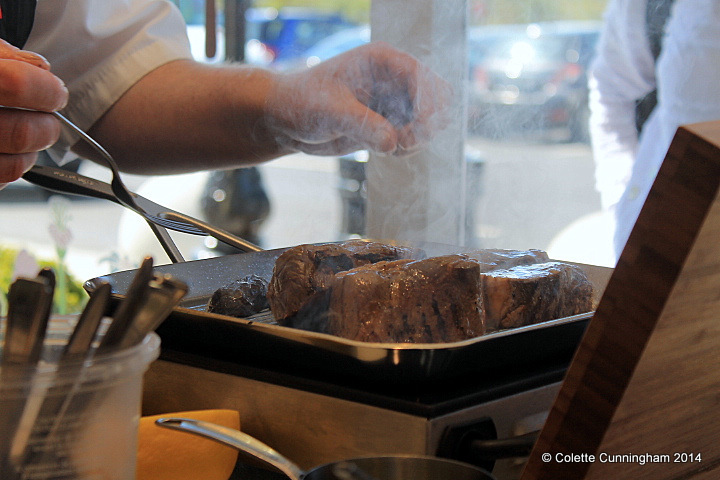 Chefs · Cookery Demonstrations · Irish Food · Other Bits! 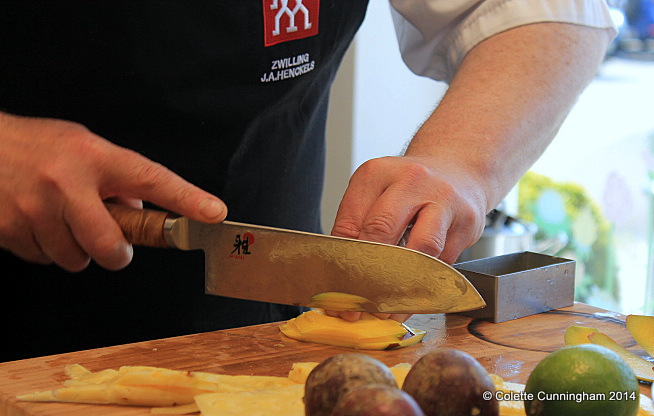 I was invited recently to a demonstration of Zwilling J.A. Henckels products, at the Zwilling J.A. Henckels store, which is located at Kildare Village, Nurney Road, Co. Kildare. 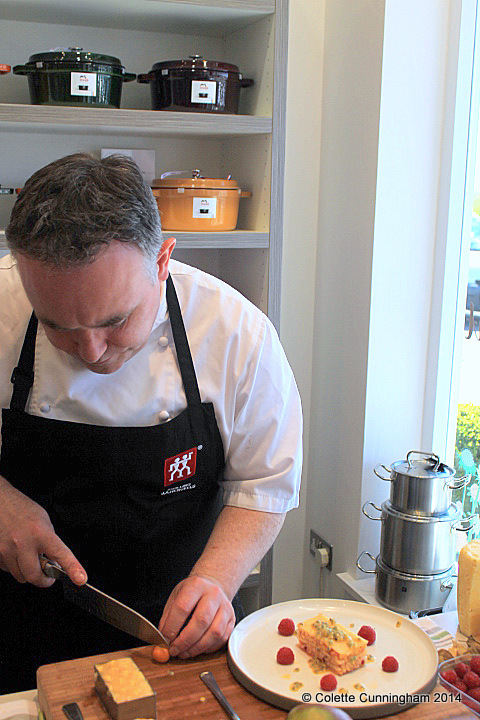 Award-winning Head Chef, and contestant in this year’s “Great British Menu“, Raymond McArdle was showcasing four of his own dishes, using some of Zwilling J.A. Henckels kitchen products, and a beautiful knife from the Miyabi collection, during an entertaining and delicious presentation. 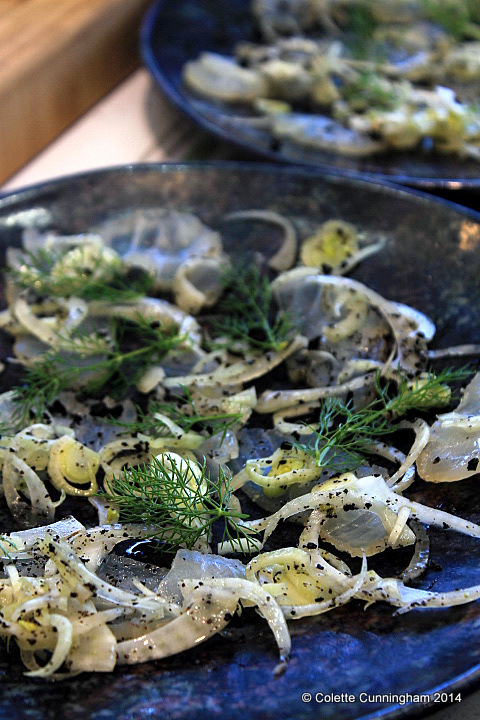 We were treated to Cod Gravadlax, served with slices of fennel and a sprinkling of Dried Black Olive powder. 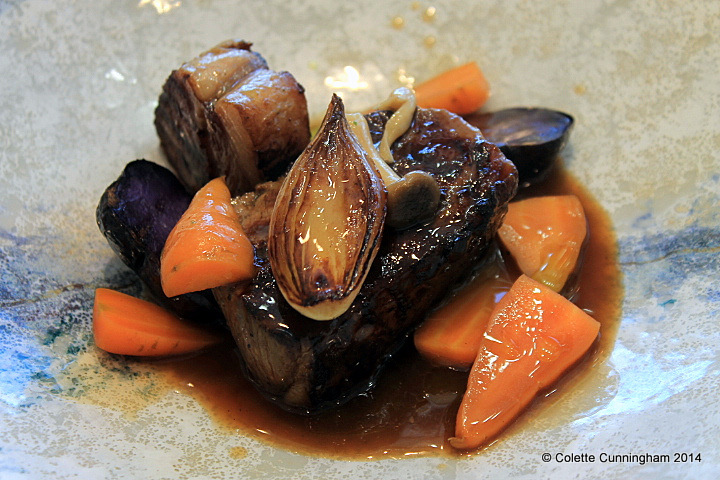 Mourne Blackface Lamb featured for Chef’s main course presentation. 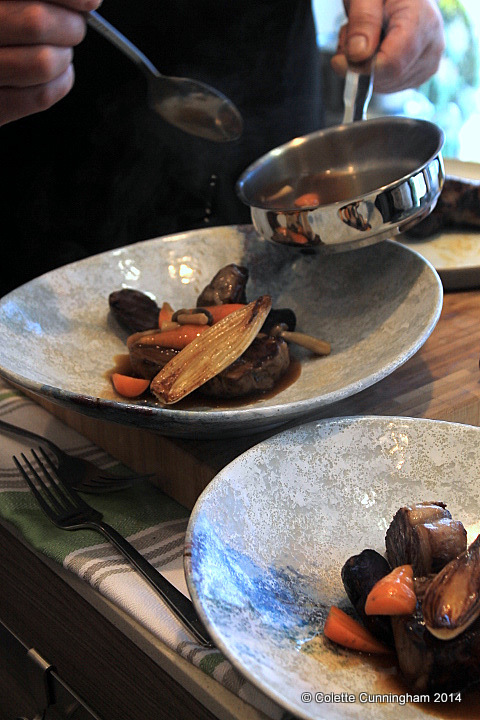 The rump of lamb was first cooked Sous Vide, then pan seared and served with confit purple potatoes, pickled carrots, and fried shallots. 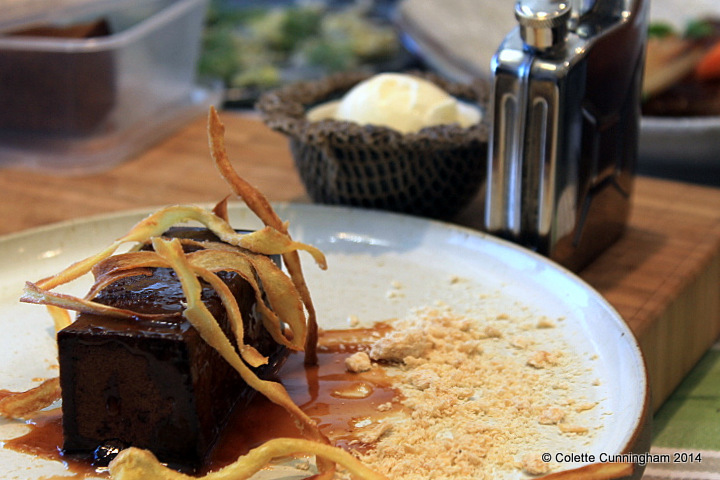 For dessert, Raymond showed his dish from the Dessert Course of Great British Menu, a Parsnip and Ginger Cake, served with Parsnip crisps, caramel sauce, Horlicks custard, and ice cream. (This dish was based on products available during WWII, and used parsnips instead of sugar, which was rationed at the time). 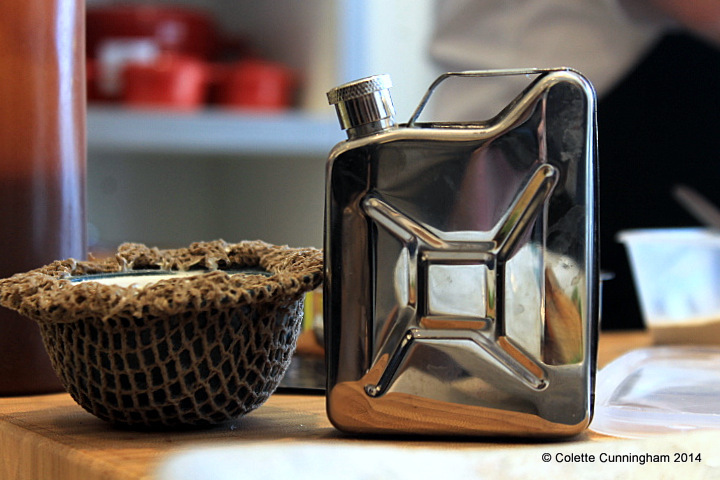 In keeping with the Great British Menu theme, Chef Raymond served the custard in a miniature Jerry Can, and the ice cream in a specially commissioned bowl, designed to look like a Combat Helmet. He also showed us his Fruit Salad “lasagne” , a simple, elegant dessert which would be a delectable finale to a dinner party or other special occasion. Lots of chopping, made easy, when you have the right blade. 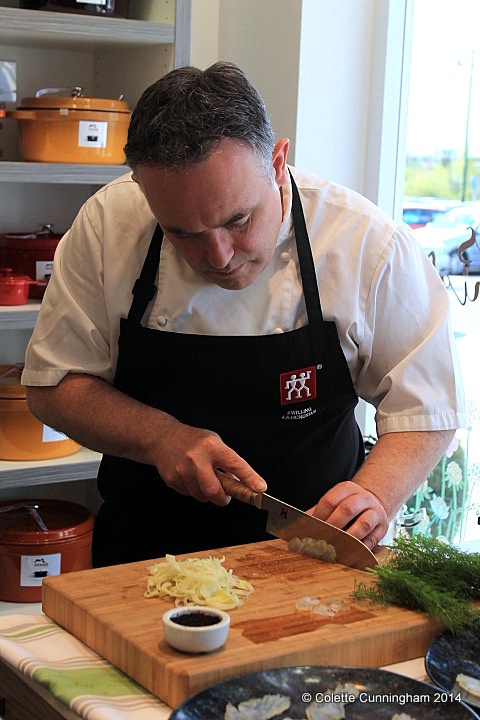 My thanks to Ms. Irene Beattie (Concession Manager at Arnotts, Dublin, for Zwilling J.A. Henckels), to Mr. Simon Rowland (Retail Sales Manager, Zwilling J.A. Henckels (UK) Ltd), to the staff at the store, and, of course, to Chef Raymond McArdle for a thoroughly enjoyable afternoon. A fantastic written, illustrated and beautifully photographed blog capturing not only the food but the products used an inspiring read an absolute credit to Colette for a wonderful insightful blog.